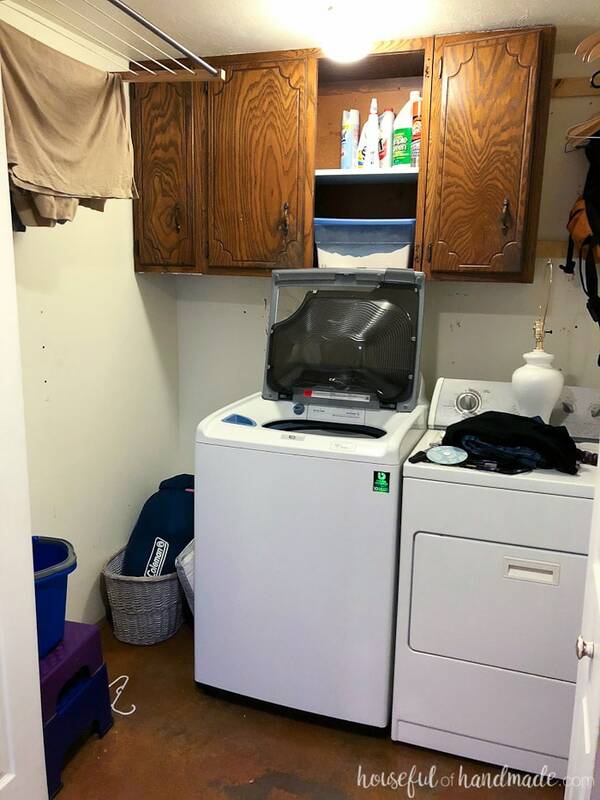 We are turning our boring laundry room closet into a magazine worthy space with this month’s $100 laundry room makeover. With a bit of creativity and a lot of DIYs we will transform this ugly room into a modern farmhouse laundry room. Do you think you can remodel an entire room for only $100? 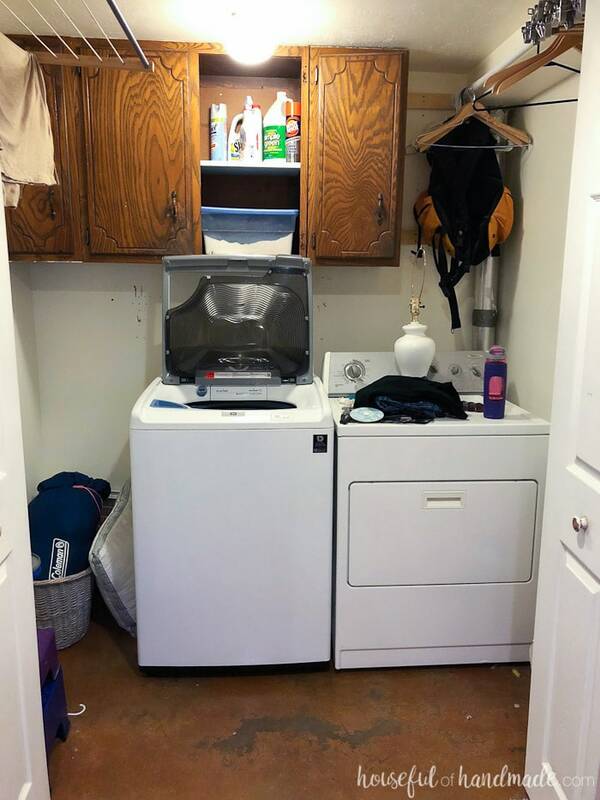 This month we are remodeling our laundry room on a budget. We are transforming our boring space, full of hand-me-down cabinets and non0functional racks into the laundry room of my dreams (if I dreamed of laundry rooms). 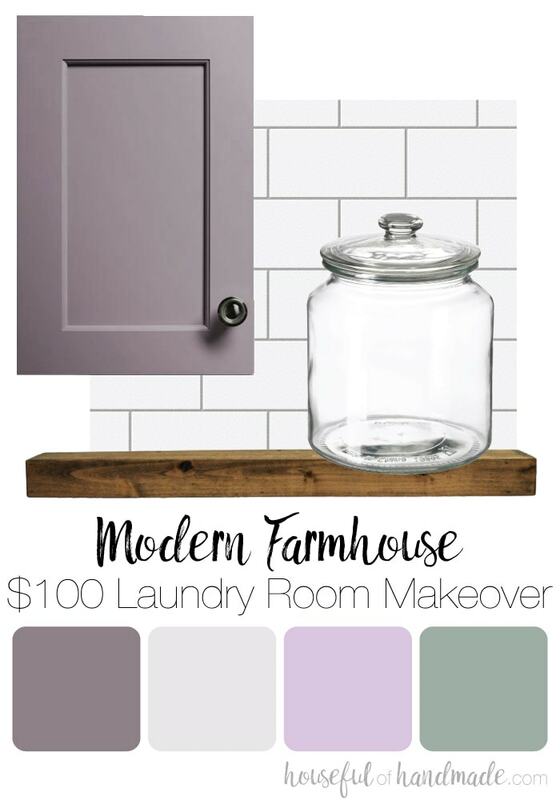 Come see our plan for the $100 laundry room makeover. 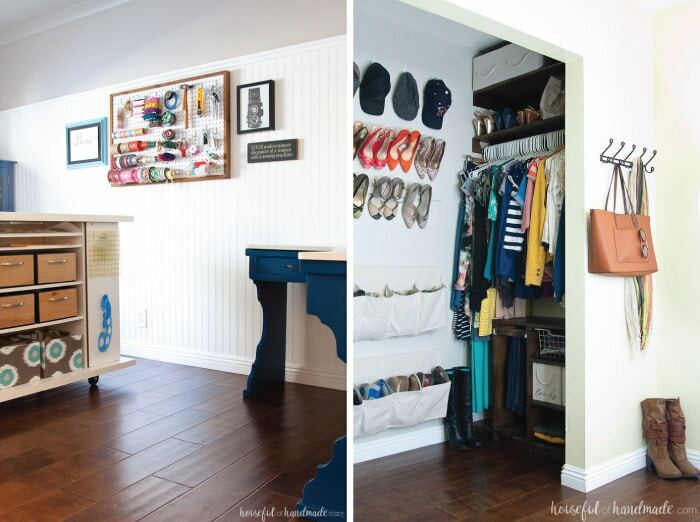 And then follow along every week in January as we share all the budget DIYs and decorating tips. I cannot believe it is January! How the year has flown. But the beginning of a new year is the perfect time to refresh a space. I loved participating in the $100 Room Challenge hosted by Erin at Lemons, Lavender & Laundry twice last year. It was so fun transforming our kids nursery into my dream office & craft room and completely remodeling our master bedroom closet with custom built-ins. And each time only spent $100! It is incredible what you can do with some creativity. This month I just couldn’t pass up the opportunity to participate in the $100 Room Challenge again (even though I told my husband I was not taking on any big projects until after the kitchen remodel, oops). But every time I open those bifold doors to reveal the most uninspiring laundry room I imagine all the wonderful ways I could fix this space. Of course, it’s a laundry room so I will never love it (unless it comes with a personal assistant who will do the laundry, my most loathed of homemaking tasks). However, I might just create a space that makes laundry more bearable and somewhere I won’t be embarrassed if the doors are left over when company comes. So here are the before pictures of our uninspired laundry room. When my parents remodeled their kitchen last spring, they so kindly gave me some of the old ones that they were not using in the garage. 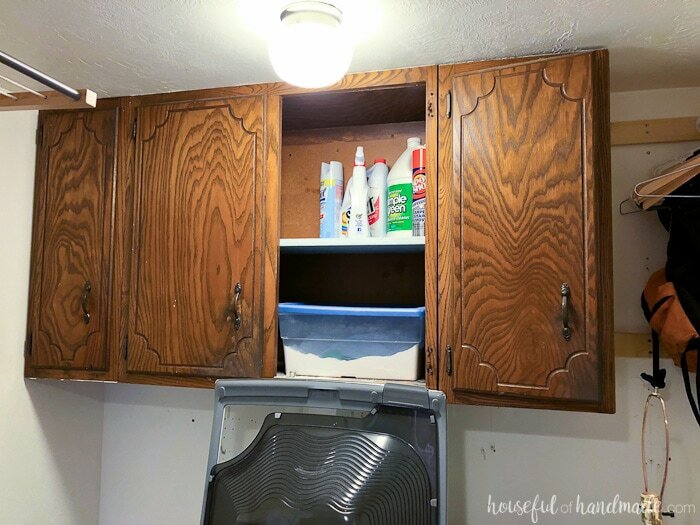 These old cabinets are structurally sound, but not pretty at all! And after installing them, I realized my light fixture is too big and the one door would not open (hence the one door cabinet). These will be getting a makeover so they are clean and fresh and beautiful. When we finished our basement about 11 years ago, we decided to just seal the cement in our basement laundry room. It was a brilliant idea. Especially when our old front loader washer didn’t drain and exploded a tidal wave of water all over me and the laundry room at 10PM. 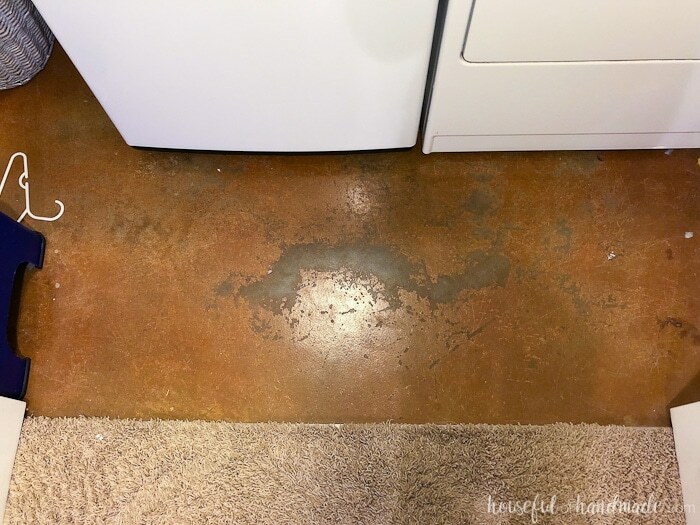 Since the concrete sits lower than the carpet, it helped contain most of the water and I was able to so easily clean it up with a wet/dry vac. I was shocked at how dry the carpet outside the laundry room was (there was a LOT of water). But the floor is looking old, and the rusty brown color is just not me anymore. I’m thinking of turning to my budget stencil trick to transform it. Our laundry room closet is a decent size, for a closet. There is a significant amount of room on the side of the washer and dryer. Right now, we utilize the space by stashing anything we want to ignore like this old broken laundry basket, a pair of ripped jeans, sleeping bag, and a branded duffle that we don’t use. This is all leaving and instead I am transforming it into useable space!!! On the one wall, we have a laundry drying rack installed. It is high enough that it is not in the way of doing laundry, but if there are clothes on it, it makes the room feel so much smaller. Also, we have so many clothes that we hang to dry that I also bought a folding rack that we use all the time. So this one is going to go and instead I plan on putting something pretty on that wall. Not exactly sure what yet, but just know it will be absolutely beautiful! On the other wall, I installed a closet rod near the ceiling. This rod will be staying because it is hella useful. We use it to store hangers when they are empty. To hang clothing as you remove it from the dryer. 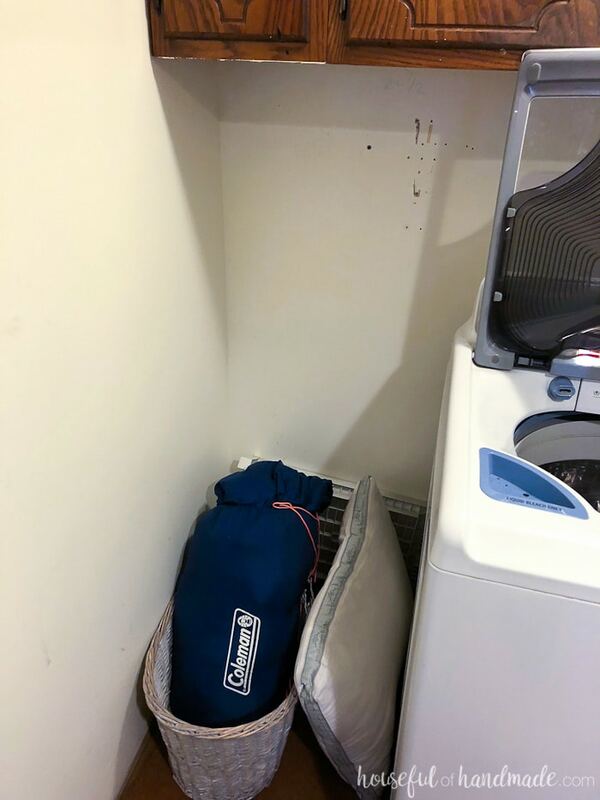 And in the back corner by the cabinets, we have the perfect nook to store away my husband’s hiking backpacks so they are ready to go when adventure strikes. The last part of our makeover will be the space behind our washer and dryer. Right now, if the washing machine is pushed back to the wall, you cannot open the lid all the way because the cabinets are in the way. So I have the machine pulled out about 12 inches. I want to turn that waisted space into a shelf to store laundry detergent and other important laundry stuff. But of course, in a very pretty way. Are you seeing the theme in our laundry room makeover? Pretty and functional! 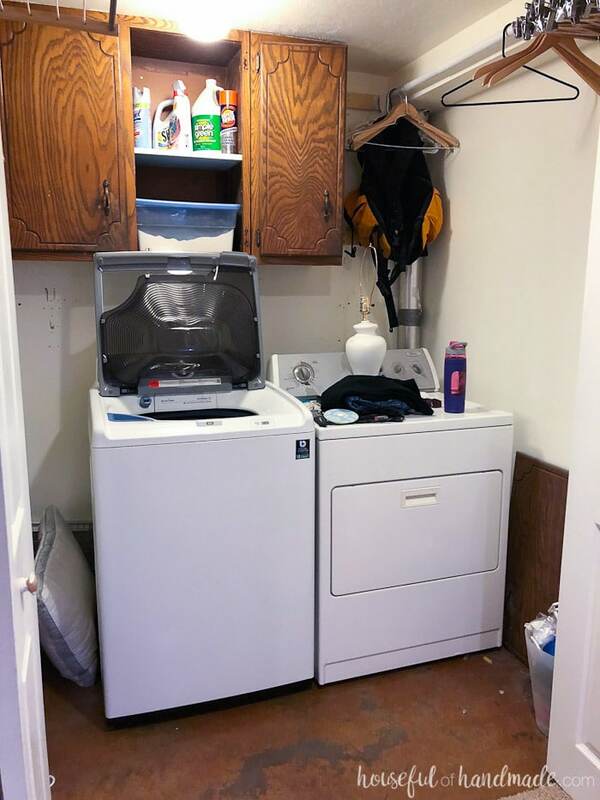 I want a beautiful space that looks like a magazine laundry room, but for only $100! Is that crazy? Or impossible? I hope not! That’s a big list for only $100 and one month. With some DIY, creative use of supplies, and lots of luck I am sure our laundry room will look amazing. Also, thankfully we do have 5 weeks in January to finish the makeover. And I am not the only one taking on the $100 Room Challenge this month. Check out what everyone else is planning below. There will be so much fun, creativity, and budget renovating this month to enjoy! Want to join in? Grab your paintbrush and get ready. 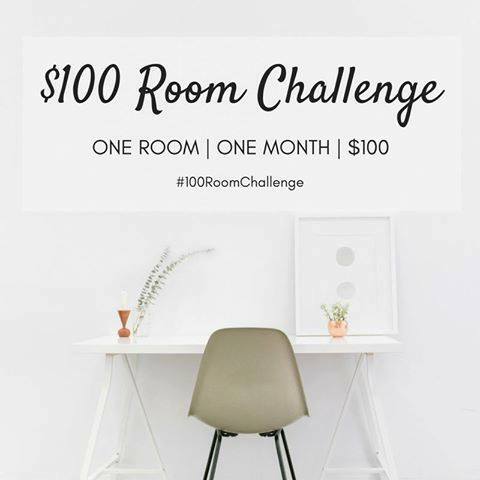 Share your posts below or on Instagram with #100roomchallenge. For more information, check out all the details from Erin at Lemons, Lavendar & Laundry here. Stay tuned for lots of DIYing! I LOVE the color palette! I can’t wait to see how you make it gorgeous! Oh, this is going to be SO good! There’s so much potential in this small space, and I know you’re going to bring it out! Thanks for the confidence Jenny! I’m right there with you. Our laundry room is hideous. A sure candidate for a makeover. This time I’m tackling my office since I spend so much time in there, but I excited to be inspired by you and the others who are working on their laundry rooms for a future project. I did my office last year and it makes working so much better! Enjoy, I can’t wait to see it! So much potential and can’t wait how you inspire me to spruce up my laundry area too! I saw your Instastory today of you stenciling the floor! It is going to look amazing!! I’m so excited to see the flooring stencil! yay! My laundry room looks a lot like yours right now! I can’t wait to see what you do, so I can get inspired to makeover mine! Your mood board is so pretty! I can’t wait to see how this turns out! I love your mood board and cannot wait to see the finished result! I’m especially excited to see the floors! It’s going to look so good! Thanks so much Maria! I am so excited to see it all come together!